Metaphase Arresting Solution is a mixture of colchicine/vinblastine sulphate dissolved in PBS. Both compounds inhibit the formation of mitotic spindles and are used to increase the percentage of metaphase cells for chromosome studies. Vinblastine sulphate has been found to be more effective against bone marrows, difficult tumours and problematic tissues with low mitotic indexes, and where colchicine/colcemid appears to be ineffective. Highly refined solution of colchicine/vinblastine sulphate in PBS, used to increase the percentage of metaphase cells for chromosomal studies. The product is designed to be more effective than colchicine alone for bone marrows, difficult tumours and other problematic tissues. 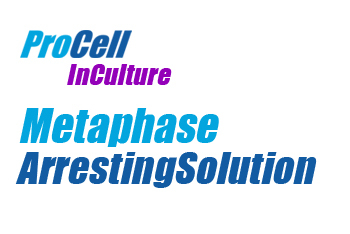 Metaphase Arresting Solution has been found to be useful for sensitive cultures where cells lift off when colchicine is added. It is gentler than colchicine so cells do not have such an adverse reaction. 2. After incubation continue with your usual harvest protocols.